I’m a firm believer in climate change. 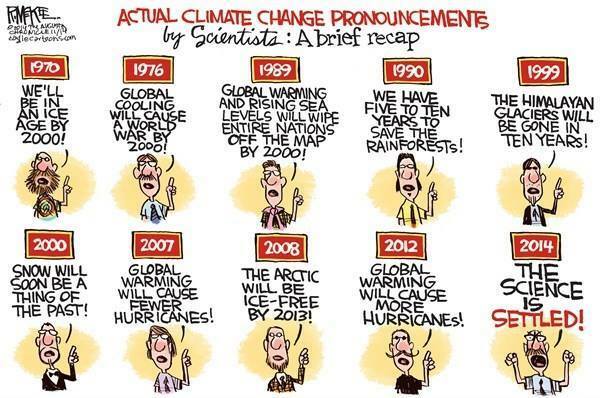 Heck, there have been several ice ages and warming periods, so it’s obvious that temperatures shift over time. And while I’m not particularly qualified to assess such matters, I’m also willing to believe that human activity has an effect on climate. Moreover, even though I much prefer warm weather, I’m also open to the idea that global warming might be a bad thing that requires some action. But here’s the catch. I don’t trust radical environmentalists. Simply stated, too many of these people are nuts. Environmentalists assert that you’re racist if you oppose their agenda. Some environmentalists don’t believe in bathing. How about the environmentalists who sterilize themselves to avoid carbon-producing children? Or consider the environmentalists who produce/use hand-cranked vibrators to reduce their carbon footprint. There are also environmentalist who claim that climate change causes AIDS. And environmentalists put together a ranking implying that Cuba is better than the United States. Then there’s the super-nutty category. The environmentalists who choose death to lower their carbon footprints. But you know what’s even worse than a nutty environmentalist? What terrifies me far more are the very serious, very connected, and very powerful non-nutty environmentalists who hold positions of real power. These folks are filled with arrogance and hubris and they have immense power to cause damage. If you think I’m exaggerating, here’s some of what was contained in a release from the United Nations Regional Information Centre for Western Europe. By the way, remember that these excerpts are not the unhinged speculation of some crazy conservative or libertarian. These are actually the words – and stated intentions – of the U.N. bureaucracy. They want central planning on steroids. Wow. These people want to “intentionally…change the economic development model” that has produced unimagined prosperity. And they want to replace it with central planning by people who have never demonstrated any ability to generate wealth. I’m not joking. If you look at Ms. Figueres’ Wikipedia page, you’ll see that she has even less experience in the private sector than President Obama. Yup, just exactly the kind of pampered (and tax-free) global bureaucrat who should have the power to treat the global economy as some sort of Lego set. Thomas Sowell has made the very important observation that there’s a giant difference between intelligence and wisdom and Ms. Figueres is a perfect example. To give you an idea of her cloistered and narrow mindset, she was quoted by Bloomberg as expressing admiration for China’s totalitarian regime over America’s democratic system merely because it ostensibly produces the policies she prefers. China, the top emitter of greenhouse gases, is also the country that’s “doing it right” when it comes to addressing global warming, the United Nations’ chief climate official said. …China is also able to implement policies because its political system avoids some of the legislative hurdles seen in countries including the U.S., Figueres said. …The political divide in the U.S. Congress has slowed efforts to pass climate legislation and is “very detrimental” to the fight against global warming, she said. And the icing on the cake, needless to say, is that China’s environment is a catastrophe compared to the much cleaner air and water that exist in the United States! 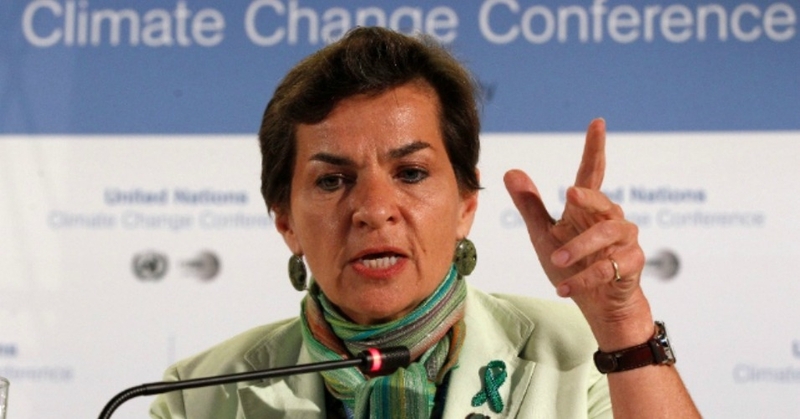 Though you won’t be surprised to learn that Ms. Figueres is a great admirer of President Obama, even if he does represent a backwards democracy. The climate chief even held up President Obama as a shining example of steps countries can take to tackle global warming. Reminds me of a saying about birds of a feather, though I’m not sure how a bird with two left wings can get off the ground. And don’t even get me started on all the exaggeration and hyperbole that is generated by the radical environmentalists. Though this Jim McKee cartoon is too good not to share. P.S. Environmentalists are also grotesque hypocrites, as you can see here and here. P.P.S. But to close on an upbeat note, we have some decent environmental humor here, here, here, and here. mis-informed characterizations of environmentalists’ with no back up of proof by dis-interested parties. on April 18, 2016 at 8:14 am Will “Mind-Blowing” Demographic Change Lead to Fiscal Disaster? well now… the lefty governor of Washington and his paramour are under federal investigation for influence-peddling… you guessed it… more green energy shenanigans… he has stepped down as governor… gosh…….. I wonder why? when the bottom falls out… just who do you suppose tesla will turn to for a cash fix? these folks don’t need a viable business plan… or the capacity to compete in the marketplace…. all they really need is the ruse of clean energy… and enough money to placate the political class… either in the form of campaign contributions… or direct payments to someone’s fair haired child..
the smell is almost unbearable… you would think it was rotten……….. instead of green……………..
Smapple, the issue isn’t thermometer readings. Apart from weather observers, other scientists have clearly documented warming in the ten physical indicators of such climate change. Of ten indicators, all ten show warming, especially compared to 100 years ago. Romans 1.20 warns us that God has laid out the evidence. Those who deny it endanger us all. The Ramirez cartoon is telling. Perhaps the last statement is close to accurate, but every other one is made up by some Earth-burner posing as a capitalist. Typical of the grotesque distortions of science and history this blog and its supporters traffick is the claims of CO2 concentrations, by drrichardsky. Not 3 to 4 parts per million. CO2 today bumps 400 parts per million, a hundred times more than drrichardsky admits. Yes, CO2 is a trace gas. It’s the trace gas that heated this planet enough that is not a dead iceball; and with that same power, it can overheat the planet, as we have seen recently. Mr. Mitchell, I would challenge you to not generalize, and be specific in your concerns about UN officers talking about changing the world economy. You offer a view that suggests a Soviet-style central planning bunch. Instead, the UN has worked to increase markets for small farmers and those who practice good soil conservation, to boost food production without the use of environment-damaging chemicals. They work on free enterprise solutions, and you condemn them for it. Wow. Apparently, regardless of the accuracy of a thermometer 100 years ago, two government agencies have been changing the data to support their conclusions (linked below). I’m not familiar with the people who are making these claims, but I’m no more familiar with the people making the AGW claims in the first place, so take this as what it is: another data point that indicates the science probably isn’t settled. FACT: We do not know if the world is warming or cooling. The data is simply not there. Show me the thermometer used 100 years ago that was accurate to even 2 degrees absolute. Then show me the wet bulb temperatures so they can say they considered heat content, not temperature. Then show me how many places they were taking temperatures 100 years ago… don’t get me started on CO2 measurement over that period. The associated errors exceed the quoted quantities by orders of magnitude. I’m an engineer who has messed with data (sometimes wrongly as well) his entire life, and I can simply state we do not know. But we cannot let radical assertions drive our lives. I might be tempted to believe them if they did a “back to the pond” experience. But, no- they refuse to give up AC, heat, plastic Evian bottles, washers, dryers, jet airplanes and every other thing that we engineers have done. Seems all we have done is afforded them the very instruments and spare time they use to complain about the very lifestyle we have given them. Here is a fact that very few people (liberals in particular) know: The current makeup of the atmosphere is almost all nitrogen and oxygen. Carbon dioxide makes up 0.04%. Not 4 percent. Not 4 tenths of a percent. 4 hundredths of a percent – 4 parts per million. In the 50-years-or-so span of time the climate changers cite, CO2 has gone from 3 parts per million to 4 parts per million, a net increase of 1 part per million. Gadzooks!! …Oh yes, conversely, if human growth had been faster by a mere fifth in the last two millennia, then we would be living in a fantastical world. People a couple of hundred years old would be meeting in tennis courts and comment: “ Do you remember when people only used to live eight decades or so? Those poor bustards. But you know, even as recently as our grandparents, people had much shorter lifespans. My grandfather, for example, died 172. He cut his head off with an eleventh dimension string fission saw, and those idiot doctors could not even fuse it on again — back then”. Instead, we have to, for the time being, accept our short lifespans. Because most of historical times, have been frought with statism and its parent coercive collectivism. Had we as a species restrained from that, even by e mere fifth, we would already be living in fantastical times. How’s that for an impact? I’m sure global warming is terrible in comparison. One person bets that the world will get worse as times goes by (primarily through environmental degradation). The other says that the future holds things so fantastical, that we cannot even imagine them. If you had to make a bet using your real hard earned money, whom would you place your bet with? Ridiculous? Impossible? Yes, perhaps like saying in 1850 that one day people will fly. The ones who have consistently made fools of themselves are those unable to admit the fantastical things of the future. The same goes for the Democrats whining about doing away with filibusters or the nuclear option until they want to use it themselves. Sowell is spot on, intelligence does not equate to wisdom! A lower growth trendline (even by a fraction of a percent) compounded over the next century will have much more tragic consequences (in foregone fantastical things, technology, medicine, bionic longevity, wealth etc.) than global warming ever could. That is where the precautionary principle should be applied to: Lower Growth. Realizing this, Eco-defeatists are upping the imagined consequences of global warming, to increase the expected value of consequences (Consequence x Probability). Mandatory conscription to the cause of climate activism is emerging as the main global vehicle of coercive collectivism. Just ask the eco-defeatists, how many aspects of your life they would like to change as part of their “plan”. Is there anything they would NOT change? Breaking free of the defeatistism of eco-coercive-collectivism is emerging as a top priority for nations aspiring to be in the top of 22nd century prosperity rankings. BTW, given America’s precipitous acceleration towards coercive collectivism, long before Al Gore counts another 1C rise in world temperatures, American voter-lemmings will have ceased belonging in the group of most prosperous middle-classes of the world. THAT is the existential problem Americans should be worried about. If world growth had been slowed down by a fifth in the last two millennia, we would still be living in the middle ages. Because human growth has irreversibly accelerated, the next one hundred years will likely bring more change than the last one thousand. Just think of one of the many nascent possibilities: Humans are about to take control of their evolutional and biological destiny. No, it’s not here yet, but it’s already in the horizon. Carbon is the basic element of all known life on this planet. It is also one of the most naturally-recycled substances in our world, along with water, Nitrogen, etc. Plus, CO2 is a dense gas with a heavier molecular weight than free Oxygen and Nitrogen. All this talk on “taxing Carbon” is senseless from a commonsense point of view. This is all about control by controlling the natural processes (from the “back-door”). These “controllers” are nothing more than psychopathic control-freaks. With 4 feet of snow in the last 2 weeks and another 2 feet expected by tomorrow, the phrase “global warming” is no longer used in New England. It has been changed to “climate change” and the severity of the weather is hyped by mainstream media. The problem is that CO2 and “green house gases” were supposed to create a warming planet. If the planet is not warming, which it doesn’t seem to have been for the last 20 years, the environmentalists’ argument against carbon emissions falls apart. Yet, the strategy to resolve our weather problem continues to focus on carbon. It doesn’t make sense. If there actually is a climate change problem, the best way to deal with it is a robust economy, for which carbon is a critical component. Science wrapped in politics …. buyer beware. Great post!